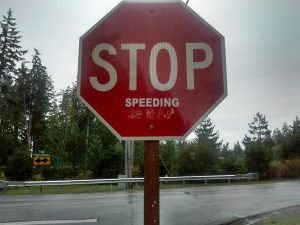 The in basket: Tom Baker sent along a photograph of a stop sign at Anderson Hill and Old Clifton roads in South Kitsap to which someone had added the letters “SPEEDING” beneath the word stop. “Is this an allowed modification or have the county sign techs not noticed it?” Tom asked. The out basket: Following Tom’s lead, I asked county public works about it, and got the following answer from Doug Bear, their spokesman. “The stop sign at that location is maintained by the city of Port Orchard,” Doug said. “Our sign technicians called to let the know and they will remove the “speeding” legend. The in basket: Phil Crane, who says he drives a van pool, writes, “For the last few months I’ve noticed some changes in the road leading to the overpass toward Gorst. “Just past the motorcycle dealer, HOV lane…the road is sagging in a few spots…one spot has about a six inches depth in the middle…the depressed area being about five feet in diameter. The out basket: I have to say I had not noticed it before leaving the county for a time, but asked Claudia Bingham-Baker, spokeswoman for the Olympic Region of state highways, if they had. The in basket: Larry Blain writes, “A few days ago I was once again behind a vehicle with a bike rack completely obscuring the rear license plate. This set me thinking. “Whether that is legal or not (I suspect not), what is the percentage of the vehicles crossing the Narrows Bridge that the automated license reading equipment are unable to identify? I can see this happening from hidden license plates such as I observed, paper license plates on darkly tinted windows on newly licensed vehicles, and out-of-state vehicles. “Since the same problem also would apply to tolled HOV lanes and the SR-520 Bridge, the amount of lost revenue probably is significant. “Is any effort made to identify vehicles with unrecognizable license plates that are repeatedly observed by the cameras? The in basket: The state’s toll division answers, “The toll equipment photographs the front and rear license plates, so if the rear one is obscured, we can still read the front one. Per state law, front plates are required for all vehicles issued a front plate. “Our toll equipment takes photos only of the area of the vehicle around the license plate, because it is illegal to photograph the inside of vehicles. “We have agreements with the other states that they will provide us the vehicle owner’s registered address so we can send a bill to that address. The in basket: Don Brandvold asks “Who cleans the signs that are on our highways? On Highway 16 heading to Tacoma, after you pass the women’s prison on the right but before you reach the cemetery on the left, there is a sign for Good To Go! that was put up about a year before the new bridge was ready for us to use. The out basket: I asked both the state and Kitsap County about this, and Jeff Shea, the county’s traffic engineer got back to me first. “We have nearly 20,000 signs on county-maintained roads,” Jeff said. “In 2015 our five sign specialists cleaned over 5,000 signs. Each specialist is responsible for approximately 4,000 signs. Each sign is a reflection on how they do their job, so keeping signs legible is a high priority. The specialists inspect all the signs they are responsible for every year. If the sign can’t be cleaned, it is replaced. “Signs are placed to help ensure the motoring public’s safety. When signs aren’t legible, they can’t serve that purpose. There is even some thinking that shows signs that are dirty and difficult to read create an impression they are not important, and motorists may disregard a sign because of its condition. “Kitsap County’s weather adds challenges to sign maintenance. Overhead canopies, rain, and a lack of sunshine in certain areas promote the green growth seen on some signs. We also deal with a considerable amount of vandalism that obscures legends on signs, or makes the sign less legible. “Our charge is to keep all county signs in excellent condition. We invite the public to let us know if they see signs that need attention, whether they are on the ground, leaning, or dirty, by calling Kitsap1 at 360.337.5777. Claudia Bingham Baker of state highways’ Olympic Region, said, “I would echo what Jeff said about the importance of roadway signs and the challenges crews face keeping them clean and legible. In addition to what Jeff said, we do reviews of sign reflectivity during night hours. Any signs we see that no longer have adequate reflectivity are replaced or washed. The out basket: I’m sure that C.J. won’t be surprised that the answer is 25 miles per hour there, the default speed limit in cities. That’s the answer I got from Chal Martin, public works director for the city of Bremerton. The in basket: George Bolton said a depression in the sidewalk in the 5000 block of Dream Court in Central Kitsap west of Silverdale is a serious tripping hazard and needs the county’s attention. I suspected it would be the responsibility of the homeowner in front of which the sidewalk runs, but I asked the county about that. The out basket: To my surprise, Kitsap County Public Works jumped right on it within a week and filled the depression – partially. It looked like they hadn’t brought enough asphalt, as the depression was only half-filled, but I saw that filling it more fully would have trapped water in the homeowner’s driveway, into which the depression extended. I asked if the notion of property owners being on the hook for sidewalk repairs, something the cities hereabouts mention often, doesn’t apply to counties. Jacques Dean, county road superintendent replied, “Road crews have filled in the depression in the sidewalk with hot mix asphalt. This is a temporary repair until such time as it can be programmed for permanent repair. The in basket: Barbi Chapman recently returned to the local area and makes a case for major improvements where Dickey Road in Central Kitsap makes a 90-degree turn at its intersection with Apex Airport Road and the turning traffic has the right of way. “We bought a house in Sterling Hills (on Apex Airport Road) and I have to contend with the lack of signals and/or stop signs a dozen times a day, along with no sidewalks to walk safely,” she said. “I’ve never seen an intersection quite like (this), with only one stop sign for the people heading out of Apex Airport Road. “It is a bus stop for Silverdale Elementary, and the Central Kitsap middle and high schools,” she said, adding “I cannot let my kids stand there, in the dark with no sidewalks, no curbs, and no traffic signals. She continued with a list of additional concerns. – “Dickey Road is a long straight-away where people pick up excessive speed and then try to make the right turn onto Apex Airport, (thereby) overshooting the turn and coming into oncoming traffic to those heading on Apex Airport toward the airport or attempting the left onto Dickey. – “Because the town dump and quarry are located on Dickey Road, the Mack trucks, dump trucks, and trucks with two cargos attempt that turn and simply are too large and have to swing into oncoming traffic to complete the turn. – “CK school district has plans to build the new bus lot on Dickey Road. Can you imagine the traffic with the buses attempting this same intersection with no stop signs or lights? – “A new development on the corner of Apex Airport and Dickey roads is under construction with the addition of 40 condos and all that impending traffic. – “Sterling Hills has plans for phase 3 development. Seventy-five houses are slated for construction within the next two years. That’s another 150 cars, at least, attempting this same intersection daily,” she concluded. The out basket: Kitsap County Traffic Engineer Jeff Shea responded. “The development along the southeast corner of the intersection is constructing curb, gutter and sidewalk along the frontage of that property,” he said. “The development will also be constructing additional lane width along the east and south sides of the road. This will allow truck and bus movements that shouldn’t encroach on opposing traffic lanes. “At the current traffic volumes, the intersection of Dickey Road and Apex Airport doesn’t warrant a traffic signal. The developments and the school improvements have triggered warrants for a signal at Anderson Hill and Apex Airport though. That signal is in the early stages of project development. “All reported collisions that occur on county roads are put into a state database that is accessible to the county Public Works Traffic Division. A review of all the collisions at the intersection of Apex Airport and Dickey roads for the last five years showed only two. One was a run-off-the-road and another involved a vehicle that ran the stop sign. We will continue to monitor this and all other intersections and corridors for collision issues. “The school district hired a consultant to look at all the traffic impacts the new bus lot would have on this and other intersections. Anderson Hill was the only intersection that triggered improvements, and as I mentioned a signal is being proposed here. The in basket: Ellen Baxter is concerned about where road closure signs are placed. “In the past year, I cannot tell you how many times a road has been closed (due to accident, tree over wires, etc.) with a dangerous closure spot,” she wrote. “For example, just this week a car went over Tracyton Beach Road. The road should be closed at Riddell and down by Lebo, in my opinion, in spots where cars can safely turn around and detour. “Instead, cars are forced to do dangerous 3-way turns in pitch black, rainy conditions because the closure was within yards of the scene. It was scary to do this in horrific weather and sight conditions. “Last year, I was forced to complete another dangerous turn-around in icy conditions near the same spot because a car had gone off, yet again. There were no driveways, no safe spots to turn my car back around. “Another example is several weeks ago during the wind storm, a tree was over the power line near Fairgrounds and Tracyton. Again, the sign came in a dangerous spot, well above Barker Creek…instead of a more logical spot down at the WIDE Barker Creek road and before the speed bumps when heading toward Tracyton from Silverdale. “We have young drivers on the road as well, who haven’t all had experience with adverse conditions, let alone, changes in directions and having to make dangerous u-turns on closed roads.” she said. The out basket: Jeff Shea, traffic engineer for Kitsap County, which handled the recent Tracyton Beach Road closure and many of the windstorm closures, replied, comprehensively, “There are state laws that govern the closure of roads temporarily. The county is fairly restricted when it comes to road closures. Basically the law allows us to close roads for emergencies and to do maintenance and improvements on public roads. For road construction, we are allowed to close a road for up to 12 hours without Board of County Commissioner’s approval. Anything longer than 12 hours requires an approved resolution signed by the BOCC board. Planned construction allows us to look at different options for traffic management. We can close the road, we can detour traffic or we can flag traffic through the construction zone. If we close a road we normally provide a signed detour route. In all cases we comply with federal and WSDOT standards for signage of any closure or flagging operation. – We don’t know when they will occur. – We have no way of knowing how long they will last. – Normally they occur during storm events, which means many roads will be closed. – Many involve utility wires in trees which we can’t clear until the utility company clears the wires. During big storms the utility doesn’t always tell us when the lines have been cleared. They are busy with multiple problems throughout the county, just as we are. – Sometimes we are directed by a sheriff’s deputy to close a road and we are not made aware of the reason. “Our first concern on emergency closures is the safety of the traveling public. The first thing we will do is close the road at the downed tree, the washed away road, or whatever it may be. We try to close it at the nearest intersection, so motorists can turn their vehicles around. This creates a problem for residents that live within the intersection and the actual obstacle in the road. They are forced to drive around the barrier to see if they can get to their homes. “Sometimes we are asked to set up detours for these temporary events. If we figure the closure will last longer than a day or two we may consider setting up a detour. “In most cases, though, the detours we are asked to set up require custom-made signs that need to be fabricated. Making and transporting the signs can take several hours in most cases. “Another problem we run into is the lack of road network in the county. Some remote closures can require miles of detour with many turns. Every turn requires two signs, one for each direction. Even short detours can take up to 10 signs or more. If we have several closures, we will run out of signs very fast. As I pointed out we normally don’t know when the road will reopen. On one closure we were about to put our last detour sign up, and the road re-opened. “A great way to stay ‘in-the-know’ is to subscribe to the county road report,” Jeff said. “This service will alert you to any road closures throughout Kitsap County.